The Cumberland & Dumfriesshire Farmers Mart P.L.C. had forward 47 prime cattle, 19 over thirty month cattle, 4,258 prime hoggs and 3,922 cast ewes & rams at their weekly sale at Longtown on Thursday 22nd April, 2010. Clean cattle were slightly sharper on the week, selling top a top of 178.5p and 172.5p for British Blue heifers from Beckhall; Charolais 174.5p Hallburn; Limousin 171.5p Beckhall. Limousin bullocks to 169.5p (x2) Englishtown; British Blue 169.5p The Gill. British Blue bullocks to £1,197 The Gill; Simmental £1,172 Sceughdyke. Charolais heifers £1,089 Sceughdyke. A smaller show of OTM cattle saw grassing and feeding cows very dear and fleshed cows similar on the week. Top price of 112.5p for Limousin cows from J.M. & K.E. Hogg, Bellbank, others 110.5p Gallowberry, 107.5p Burnfoot on Esk, 103.5p Gallowberry; Simmental 110.5p Horsegills, 105.5p, 103.5p Sceughdyke; Charolais 107.5p Smallholms; Angus 101.5p Burnfoot on Esk; Blue Grey 100.5p, 95.5p Laal Steins; Friesian 91.5p (x2) Becton Hall, 85.5p The Stubb. Heifers to 111.5p Blindhillbush. Simmental cows £869.40, £865.10 Sceughdyke, £850.85 Horsegills; Limousin £822.38 Burnfoot on Esk, £755.55 Gallowberry; Friesian £796.05, £754.88 Becton Hall; Charolais £795.50 Smallholms. Another good show of 4,258 prime hoggs sold to the usual full ring of buyers. Trade was slightly easier on the week, however good fleshed hoggs and export types were easily sold. 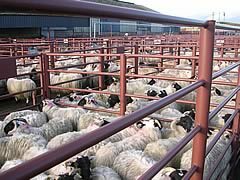 The overall sale levelled out at 192p per kilo with a top price per kilo of 262p for Beltex from Hillside and to £115.50 per head for Beltex from Newbigging, £107.50 Hillside, £103.50 Newbigging; Hill Cheviot £108.50 Blackburn, £95.80 The Land, £94.50 Catslackburn; Texel £107.50 Newbigging, £106.50, £101 Station Yard; Suffolk £102.50 Alton, £98.50 Becton Hall; Charollais £92.50 Moss Side, £91.50 Smalmstown, £89.50 Culroy; North Country Cheviot £91.80 Justicetown and Station Yard, £90.50 Wester Dunnet; Blackface £90.80, £90.50, £90.20 Smalmstown; Leicester £89.80 Alton, £84.50 Williamston; Greyface £89.50 Justicetown, £87.20 Coshogle, £86.50 Oswie; Lleyn £87.50 The Mark; Swaledale £79.50 Williamston; Vendeen £78.20 Kirkwood Mains. The 782 lightweight hoggs sold to a top of £70.80 for Texels from Kirkwood Mains, £67.50 Newbigging; Beltex £70 The Mark; Vendeen £69.80 Kirkwood Mains; Hill Cheviot £69.80 Shaw Head, £67.80 Bloch; North Country Cheviot £65.50 Graystale, £64.80 Sockbridge Hall; Greyface £64.80 Stackbraes, £62.50 Owlethirst; Blackface £64.50 Newbigging, £63.50 Culroy; Suffolk £60.80 Newbigging; Swaledale £53.50 Stotsfold. Another large show of 3,922 cast ewes and rams saw trade easier on the week with all types harder to sell, particularly heavy ewes. The sale averaged £79.95 per head and sold to a top of £162.50 for heavy Suffolk ewes from D. MacKenzie, Boggie, others £156.50 Broomknowes; Texel £150.50, £140.50 Alton; Leicester £146.50 Bellmount, £129.50 Alton, £121.50 Kilnstown; Charollais £140.50 Rashee and Roadside, £139.50 Severs; Half Bred £134.50 Rashee; Beltex £106.50 Alton, £87.50 Rashee; Milk Sheep £104.50 Seavers; Bleu d’Maine £99.50 Severs; North Country Cheviot £97.50 Wester Dunnett, £94.50 Rashee; Wensleydale £99.50 Severs; Cheviot Mule £94.50 Golden Lane, £90.50 Hewdrefor; Greyface £93.50 Alton and Nether Onsett, £91.50 Stackbraes; Dorset £90.50 Wilseytown; Vendeen £86.50 Kirkwood Mains; Ryeland £77.50 Sandholm; Zwartbles £73.50 Minsca. Hill ewes to £84.50 for Cheviots from Stackbraes, £68.50 Catslackburn, £63.50 Springwells; Blackface £78.50 Sockbridge Hall, £67.50, £66.50 Minsca; Lleyn £74.50 Torhousemuir; Swaledale £70.50 Stotsfold, £66.50 Kilnstown, £63.50 Spoutbank; Jacob £67.50 Mossband House; Herdwick £52.50 Hillside, £44.50 Mossband House and Stybeck. Rams to £156.50 for Charollais from Rashee; Texel £134.50 Coytre, £129.50 Severs; Suffolk £132.50 Rashee, £126.50 Justicetown; Rouge £118.50 Severs; Bleu d’Maine £108.50 Rashee; North Country Cheviot £94.50 Roadside, £90.50 Ballyrobert; Hill Cheviot £88.50 Sockbridge Hall; Zwartles £87.50 Rashee; Border Leicester £87.50 Severs; Dorset £86.50 Rashee; Leicester £86.50 Fordlands; Beltex £76.50 Bankhead; Blackface £72.50 Newbigging, £69.50 Penpeugh; Herdwick £67.50 Stybeck.